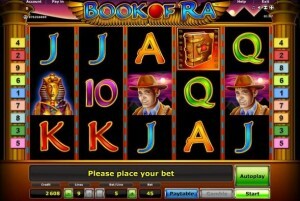 Book of Ra – Deluxe is a five reel, ten line online slot machine powered by Green Tube from the Novomatic Group. 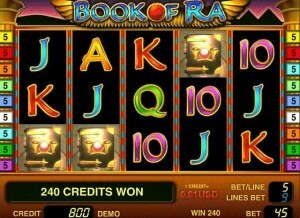 The Book of Ra – Deluxe is the latest in the series of these games including; Book of Ra and the Book of Ra 2. This game has a huge maximum jackpot of 50,000, a great bonus and intuitive scatter features. The theme is ancient Egyptian with a quirky “Indiana Jones” esque explorer symbol and the “Book of Ra” itself acting as the bonus symbol. Graphically, this game is impressive with eye catching glyphs and great animations. The play area is bordered by two Egyptian style pillars and a beautiful desert sunset complete with pyramids on top. The objective of Book of Ra is to complete a line of two to five like symbols running from left to right. The “Book of Ra” symbol also acts like a wild symbol and can be substituted for any other symbol in the game. A particularly nice feature is the expanding symbol, if you hit this symbol it will expand all over the reel and cover all of the paylines which will result in a particularly big payday for you! There are ten lines in total for you to bet on ,with bets ranging from 0.04 to 10.00 meaning the total bet for any one spin is 100.00. Players can bet on any of the ten lines and all bets and bet information is easily viewed along the bottom of the screen, keeping you in control of your game at all times. The bonus features on Book of Ra – Deluxe are great, firstly you have to hit three or more of the “Book of Ra” scatter symbols, this will give you ten free spins with a multiplier of 2x. During your free spins you will hopefully land a few “Expanding Symbols” these will spread out all over the reels they cover and land you big, big jackpots! Then finally, you may be offered the chance to gamble your money, again offering you the chance to win massive amounts. This game gives great payouts, offers fantastic prizes and is a great follow up to one of the most popular online slots of all time.